At Ziyamet (Greek Leonarisso) the character of the Karpas changes, becoming much more rural and hilly. Just beyond Ziyamet, a small town inhabited largely my mainland Turks, is a crossroads, where a fork right to Gelincik will take you, after just a couple of kilometres, to the monastery church of Kanakaria. This fork continues all the way to Kale Burnu, but the track marked on most maps between Kuruova and Sipahi is terrible and any ideas you may have of a shortcut to Sipahi should be abandoned. Even with a Jeep, the going is so slow that it is quicker to return to Ziyamet and double back on the tarmac. The large Byzantine monastery church of Panayia Kanakaria stands on the left of the road soon after entering the village of Boltaşlı (Greek Lythrangomi). A battered old red sign, scarcely legible, announces it in Greek and in English. The monastery outbuildings are gradually decaying and in the graveyard round the back, three desecrated graves of the last monks peep out above the weeds. In the semicircular ceiling above the main entrance is a well-preserved fresco of the Virgin dated 1779. The original 11th- to 12th-century church was restored at that time, giving the church stone a (comparatively) newish look. The door is kept locked but you can go into the village to ask the muhtar or headman for the key if you are really keen. Inside, a fragment of a mosaic of the Virgin and Child in the central apse was all that survived of the earliest 5th- or 6th-century church, making this the earliest Byzantine mosaic on the island. This is the fragment that was stolen on the instructions of black-market art dealers. Four sections, each measuring 61cm square, were chipped away. They depicted the Christ Child, an angel and the saints James and Andrew. On the black market for antiquities they found their way to Indianapolis, to an art dealer who paid US$1.1 million for them. She in turn tried to sell them to the J Paul Getty Museum in California for US$20 million, but Getty's curator notified the Cypriot authorities, leading to an international court case. By standing on piles of stones outside the apse windows, you can just about peer inside to glimpse the badly damaged interior. Traces of fresco can still be made out on the walls, but the pigeons have taken over wholesale. The driver further along this little road towards Kale Burnu is interesting for its scenery, rather than the sites along it, which are essentially minor. The stretch between Derince and Avtepe is most unusual, with a dramatic drop down into a huge valley and bare rolling hills all around. 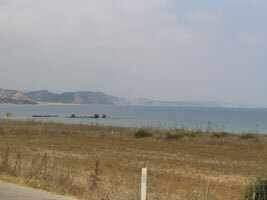 A track leads along this river valley to the sea, some 4km away, where a ruined 14th-century domed chapel, Ayios Seryios, can still be seen, to the right of the river mouth. Northeast of Avtepe there is also an unusual cave tomb of unknown date cut into a bare cliffside at a height of some 200m, and visible as you approach from afar. The climb up to it is very tricky and should be attempted only by those who relish heights and unsure footholds. Inside are many deep corridors leading to grave chambers, cut some 26m deep into the hillside. Be sure to take a good torch. At the very back is a well shaft of immense depth, which village tradition has it leads either to hell or to paradise, depending on which is more deserved. At Kuruova a bumpy track to the right heads for the coast, winding 4km across the riverbed and ploughed fields. Always bearing right when there is a choice, you will eventually reach the sea where the stones of the Middle Cypriot (c1800BC) fortress of Nitovikla stand a few courses high. It was excavated back in 1929. After wet weather the track is impassable for cars, as tractors gouge out great ruts which fill with water. At the curious semi-troglodyte village of Kale Burnu (Greek Galinoporni), the tarmac stops. On the slope around it are many rock tombs, thought to have been originally Phoenician. On the outskirts, near the ruined church of Aynia Anna, is an extraordinary cave tomb 21m long. Returning to Ziyamet, you now continue on the main road to Yeni Erenköy (Greek Yialousa), the second-largest town of the Karpas, with 2,500 inhabitants, the resettled Turkish Cypriots from the enclave of Erenköy (Greek Kokkina) to the west. The Karpas Peninsula tourist office (open daily in summer 08.00-17.00), is ably run by an ex-pat from Essex. The owner of the pastry shop at the lower end of the main street is a mine of information (in English). Beyond the pleasant rambling town, the road heads towards the north coast, and some 2km from the edge of town a track to the left leads down to the Halk Plaj or public beach, a sandy bay with swings, changing cabins and, in the season, a barbecuing area offering snacks and kebabs. One kilometre further on is the Karpaz Plaj, a simple but wholesome place offering fish, kebabs and a good sandy beach. The beach could be kept cleaner, as a certain amount of rubbish and eel grass gets washed up. After another 2-3km, a typical yellow signpost points the way to the Greek village of Sipahi and the ruined church of Ayia Trias. Situated on the right of the road on the edge of town, the ruined column stumps of this large early 5th-century basilica are visible from the road. When staffed, the site has an entrance fee, though frequently the place is deserted and the gates left unlocked. The setting is wonderfully pastoral, not to say overgrown, in the middle of orchards and fields, and sheep are frequently to be found grazing in the aisles. The site was excavated in the 1960s to reveal a large three-aisled structure. Few of the columns stand higher than head height, and the walls are rarely above waist height, but the memorable feature of the basilica is its mosaic floor paving. Open to the sky, its colours, mainly reds, blues and whites, are faded, but the intricate geometric designs are striking, mixed in with patterns of foliage and the occasional Christian symbol. The north aisle shows two curious pairs of sandals facing in opposite directions. The font can still be seen, and its cruciform shape is unique on the island. The village of Sipahi (Greek Ayia Trias, Holy Trinity) still has 100 to 200 Greeks who chose to stay behind despite partition, and as you walk about in the village you will still see old men dressed in traditional rural baggy black trousers, and only Greek is spoken. Even in the times of mixed villages, Greeks and Turks always had separate schools and there was no official intermarriage between the communities. Today the non-Greek inhabitants are Turks from Trabzon and Samsun on the Black Sea. Some 600 or so Greek Cypriots still live on the Karpas, the bulk of them in Dipkarpaz. Every Wednesday, the UN Peace Keeping Force in Cyprus, the "Blue Berets", bring in about ten tonnes of food and mail for them from Greek Nicosia. Relatives from the Greek side are allowed to visit, though problems sometimes occur. On one such visit, a Greek girl met and married a local Turk. The Greek Cypriots of Nicosia were outraged, convinced she had been abducted, and a band of friends marched on the Green Line in protest, demanding her return. A few months later, the girl returned to visit her parents in Nicosia, and stayed there. Her husband followed her, and was promptly deported by the Greek Cypriots. The numbers of this Greek community are, not surprisingly, slowly declining. Some 8km east of Ayia Trias, back on the main Dipkarpaz road, you pass the derelict Ayias Thrysos church on the left, with the Florya Restaurant almost immediately opposite on the right. A simple lunch can be taken here, and it is possible, though not ideal, to swim from the rocky bay below. The restaurant also has ten simple but adequate rooms in a separate annexe. The 15th-century church is whitewashed, with no frescoes, and empty except for a few wooden pews and the shell of the iconostasis. Lower down, close to the shore, is a smaller ruined medieval chapel, and beside it to the right is an even smaller cave church, probably Byzantine. Some 3km further on, the observant may spot the isolated church of Ayios Photios uphill to the right, approached by a bad but driveable track. Thought to be 10th century, the church has no door, and inside there are traces of frescoes showing figures on horseback and a saint with a halo. Goat droppings form the major floor embellishment and the ceiling is adorned with swallows' nests. Another 5km further east on the main road, an easily driveable dirt track leads inland just by a bridge over a dry stream-bed. This brings you after 2km to an open clearing in the thick prickly scrubland. Here, abandoned, stands the monastery of Panayia Eleousa. The small 16th-century whitewashed church has a decorated doorway, but inside the frescoes are covered in whitewash. Turks and Christians alike share the unfortunate habit of covering everything in whitewash. Swallows and waps have also moved in. The monks' cells, looking of fairly recent build, stand in a row a little apart from the church. From here a tarmac road continues round in a loop to rejoin the main road a few kilometres further on. The main road now begins a steep ascent up a fertile valley to reach Dipkarpaz, set on a hilltop. A lot of tobacco is grown in the area, and the soil's fertility is due to the abundance of wells, for the Karpas is rich in underground water reservoirs.